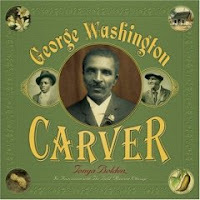 There was much more to George Washington Carver than peanuts (though I admit that prior to reading this book, I thought of him as the "Peanut Man", too). George Carver was born in Missouri during the Civil War. When his mother, a slave, was kidnapped, George was raised by the family that owned him. Since he was a young child, George had a thirst for knowledge. He loved the outdoors and nature. Neighborhood folk came to him with their gardening questions and George was able to help them. They called him the "Plant Doctor". George was handy and crafty and he could fashion tools from things around the farm. He also painted, creating paintbrushes and paints from plants that he found. Eventually George went to school and to college and graduate school. He studied and learned more and more about plants, believing that everything humans needed could be fashioned from growing things. He became a professor of agriculture and was recruited by Booker T. Washington to teach at the Tuskegee Institute, a school for African-Americans. The South during Reconstruction was a bleak place. The soil was exhausted from continuous cotton growing. The people were uneducated and under-resourced. Carver taught classes in agriculture, encouraging people to respect nature and not just take from it. He spread his teachings to people he met every day, on the street, in church, etc. He prepared pamphlets with gardening tips and advice on how to use plants in many different ways. And yes, he developed many, many uses for plants such as peanuts, soybeans, and sweet potatoes. Carver lived a life of study, finding practical applications for nature's bounty, and educating his fellow men. This biography tells his story in an interesting and accessible way. Tons of photographs accompany the text, bringing the man and his plants to life. I had no idea that there was so much more to the "Peanut Man" and that it would be such an interesting story. Weeks after reading it, Carver's story is still in my head! Hand this one to science buffs, ecologists, or anyone wanting a great biography. Be sure and check out The Brown Bookshelf's interview with Tanya Bolden. I'll certainly be checking out more of her books. You can read more reviews at Fuse #8 and Check It Out. Annnnd happy Non-Fiction Monday! Check out the other posts over at Picture Book of the Day. Thanks for the review! I'm always looking for good nonfiction for my classroom -- I'll have to check this out!